1970 just doesn't seem all that long ago, but holy moly that is going on half a century! 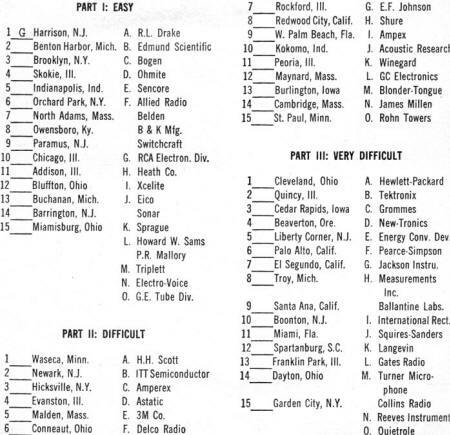 This quiz appeared in Popular Electronics to test the hobbyist's knowledge of the whereabouts of some of the major components and products companies. Many of the businesses have gone defunct, been bought and absorbed by other companies, or if they do still exist, are in new locations. It will take a real old-timer to score well on this quiz without resorting to lucky guesses. Still, there are a couple stalwart manufacturers today that even a newcomer can get right. 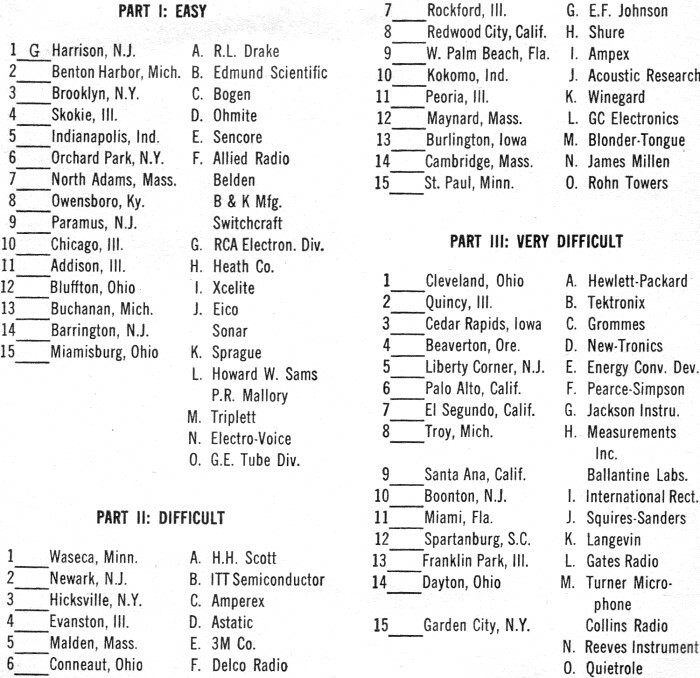 Most of the Popular Electronics quizzes were created by Robert P. Balin, but this one was dreamed up by Thomas Haskett. Good luck. Anyone who works, studies, or experiments in the field of electronics will sooner or later associate certain cities with well-known electronics manufacturing facilities. For instance, what electronics manufacturer do you think of when Harrison, N.J. is mentioned? 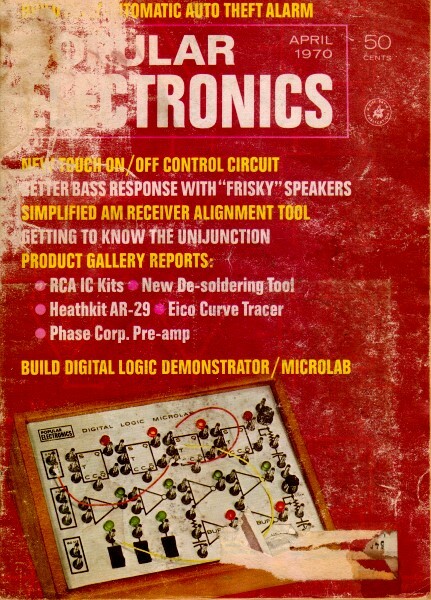 RCA Electronic Devices, of course. While there may be other smaller companies there, chances are you thought of the one most well-known. This little quiz is divided into three parts: Easy, Difficult, and Very Difficult. Even a duffer should be able to get 9 or 10 of the Easy ones. 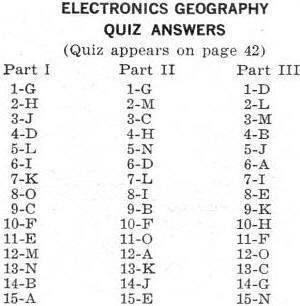 If you do that well on the Difficult, you're pretty well-informed about locations: and if you get 10 or more in the third category, you're an expert on Electronics Geography. See how well you can do - and no fair peeking at the advertisement in this magazine. Match the cities on the left with the companies on the right. Note that for some cities, a group of manufacturers is listed.